First of all I would like to thank you all No life people like me that you all are gathered here to create Awesomeness. This one is a very first project i will be posting. Disclaimer :- you will be responsible for your own actions. well its always awesome to achieve wireless electricity right?? Here is what you need to make one for yourself. 2.28-32 Gauge many around 250M Enameled copper wire. 6.Few Resistors, Caps and UFDiodes. Lets start with a complex part. Start winding the secondary wire to the PVC pipe from either side. And by secondary i mean the 30AWG wire. It will gonna take hours but it will look awesome when is finished. DO around 1000 turns tape it totally so it wont move. keep both ends open for now. Next you must wind the Primary that is the thick wire around the secondary, it must be insulated. 5-6 turns are enough. Plug the top end of secondary to a round surface covered with foil. Do check if it is going below the winding, it must not. Now time for the Power part. The driver circuit. 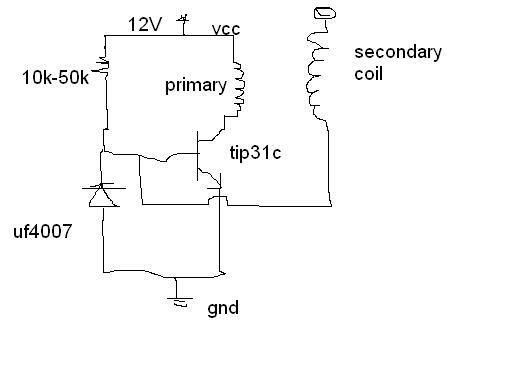 Here is the schematic you must do on your board. Make the circuit on a General purpose board, or Breadboard. Give it the Power. And Voila!! you will have your own Slayer Exciter. Awesome right?? U can build the circuit on multisim and the paste it in Microsoft office o paint . Nice work though. Can i use the TV picture tube magnet wire. I guess its 32 gauge. .. Every thing ok . But where is the spark gap? we do not need the spark gap on this projects? which resistance can use? 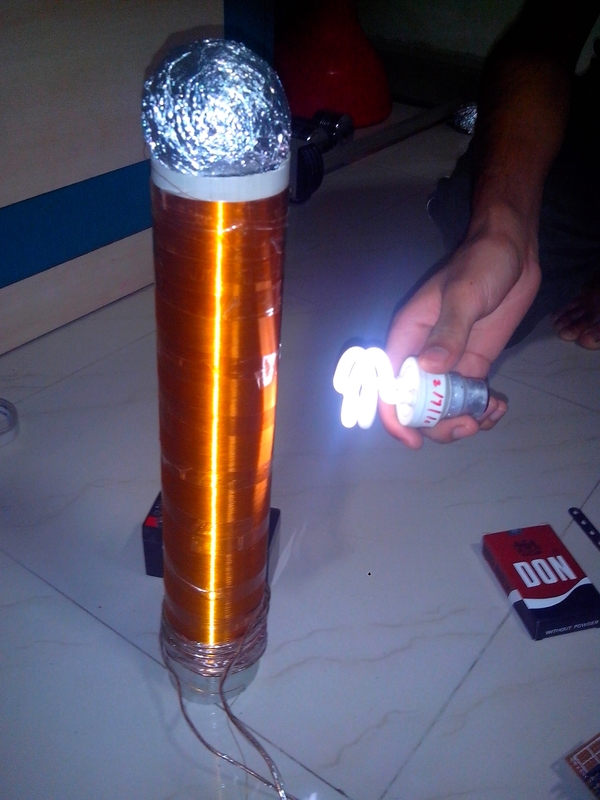 This entry was posted on July 27, 2013 by S4t4n in DIY stuff., High Voltage and tagged Slayer Exciter, Solid State, Tesla Coil, Wireless Electricity.